A popular variety but much tastier & at a fraction of the cost of supermarket-bought apples! The fruits have exceptionally sweet, rich flavour and a distinctive golden-green colour. 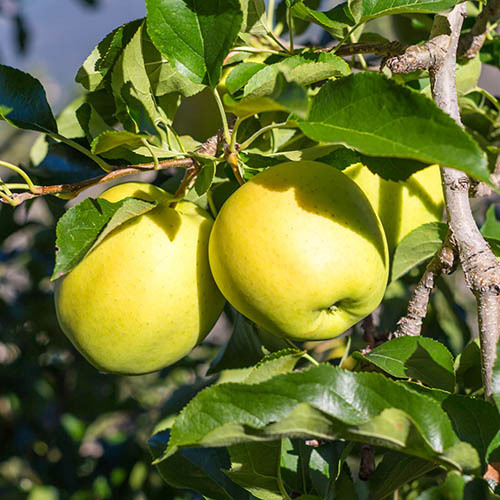 Golden Delicious is perfect for growing in the garden. It is highly versatile and easy to grow! Supplied as a 1M tall, grower quality, potted tree. Grown on dwarfing rootstock. Now you too can grow this ever-popular variety but much better tasting and at a fraction of the cost of supermarket-bought apples! Golden Delicious is brilliant for growing in your garden. Its fruits have exceptionally sweet, rich flavour and a distinctive golden-green colour. They will look wonderful as they ripen on your tree and it is also heavy-cropping and easy to grow - what more could you want?! It is a highly versatile variety that will store really well use your abundant crops to make delightful desserts and yummy puddings as well as keeping them to eat as they are! Your home-grown harvests will be incomparable to the bland, tasteless apples in the shops. The key is to let them mature on the tree and pick them once they have turned a rich, golden colour. Best of all, your tree will produce bumper crops each year, saving you loads of money compared to supermarket bought apples over its long life of over 50 years. Enjoy! Supplied as a 1M tall, grower quality, multi-branched tree in a 5L pot, well rooted . Grown on dwarfing rootstock.